» ...Documentation Home » Oracle Solaris 11.3 Information Library » Managing Auditing in Oracle® ... » About Auditing in Oracle Solaris » How Is Auditing Configured? During system configuration, you preselect which classes of audit records to monitor. You can also fine-tune the degree of auditing that is done for individual users. 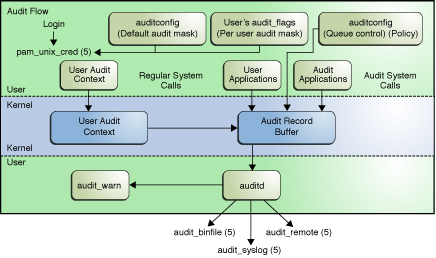 The following figure shows details of the flow of auditing in Oracle Solaris. After audit data is collected in the kernel, plugins distribute the data to the appropriate locations. The audit_binfile plugin places binary audit records in /var/audit. By default, the audit_binfile plugin is active. Post-selection tools enable you to examine interesting parts of the audit trail. Audit files can be stored in one or more ZFS pools. The collection of audit files that are linked together is considered an audit trail. The audit_remote plugin sends binary audit records across a protected link to an audit remote server. The audit_syslog plugin sends text summaries of audit records to the syslog utility. Systems that install non-global zones can audit all zones identically from the global zone. These systems can also be configured to collect different records in the non-global zones. For more information, see Auditing on a System With Oracle Solaris Zones.